This program takes you deeper into the magic and mystery of the Universal Mind. All the love, abundance and joy you want already exists within you, the secret is in discovering it. Through repeated nightly listening you will move into alignment with Infinite Intelligence. As you attune to the Universal Mind, and surrender personal will to Divine Will, what you need and want comes to you. Manifesting then becomes easy and fun. Many have already discovered this for themselves. Now you can too. With this program you'll overcome limiting, outmoded beliefs that have hindered your ability to create the life you’ve always wanted. While theta and delta waves gently lull you to sleep, The Secret Meditation II re-programs your mind with ideas that unleash your power to create a flourishing life that fulfills you on every level. How is The Secret Meditation II different? The same powerful messages are delivered in the second person to reprogram your subconscious mind from another essential perspective. This incarnation of the Secret Meditation goes even deeper into the re-programming process because it’s important to hear the truth about who you really are-- spoken to You. All the messages are audible and there are no subliminal messages. If you alternate between both versions you’ll be astonished by the impact they’ll have on your life. Through nightly listening, your subconscious will accept the knowledge it receives as true. When this happens, what you need and desire comes to you. And there’s nothing you need to do except relax and listen. If you fall asleep while listening, that's even better; the messages are still absorbed into your subconscious. As negative beliefs are replaced with self-empowering truths about your self, you’ll start attracting people, ideas and opportunities that support you in making your dreams a reality. 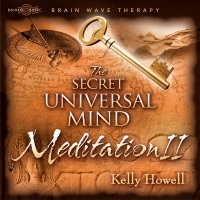 The Secret Universal Mind Meditation II is adapted from the work of U. S. Anderson. The original meditations can be found in his book, Three Magic Words.